DALLAS -- Champagne was flying from all directions as I walked into the craziest post-championship locker room celebration I've ever witnessed, and there in the center of the room was Miami Heat coach Pat Riley's motivational secret laid bare. The contents of Riley's mystery bowl -- a structure that sat covered up on the floor of the Heat locker room throughout the playoffs adorned with "Do Not Touch" signs -- had been revealed, and all across the floor were scattered thousands upon thousands of small pieces of paper, each about the size of a baseball card, bearing the words "15 Strong" on one side. 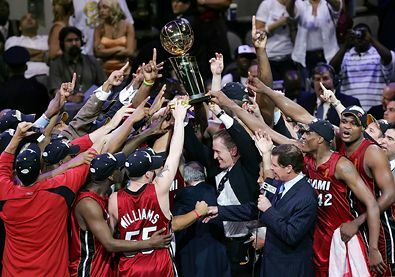 The Miami Heat hold the Larry O'Brien Trophy after the Heat won the 2006 NBA Finals after defeating the Dallas Mavericks 95-92. They said, "We don't care about shots." Of course not, we laughed quietly to ourselves. Until the games start. They said, "We're not worried about minutes." Sure, we snickered and chortled. In scrimmages, maybe. They told us, "We're just here to win a title," and our eyes rolled in unison. That's what they all say. They told us they'd stay the course if the season got off to a rocky start, and then the laughter really kicked up a notch. But in the end we were the suckers. Despite all the disparate talents they brought in during the offseason, and all the career starters who had to accept fewer minutes, and all the troubles they endured during a 10-10 start and a resultant coaching change, Miami's veteran imports stayed the course. They didn't gripe about minutes or shots or much of anything en route to the franchise's first-ever title. The Heat talked the talk that everyone talks on media day. But in a rare departure from the NBA norm, they walked the walk, too. "There was a lot of conjecture throughout the course of the year about our team, about the character, about certain players, it wouldn't work, the chemistry," said Pat Riley. "People just don't know how much these guys really wanted it." For me, it was a full-circle moment. I was at Miami's media day in October, when a group of disbelieving writers attempted to discern how all these new players planned to share one basketball, and I was as cynical as any of them. Antoine Walker, James Posey, Jason Williams and Gary Payton had all been starters the previous season. Each was accustomed to getting his 40 minutes a night and being an integral part of his team's offense. Antoine Walker told me on media day, "I understood that I'd be getting fewer touches and fewer minutes when I came here." This is Dwyane Wade's moment. This is Shaq's revenge. This is Pat Riley's redemption. Those are the names on the marquee. But Riles isn't just talking when he gets to talking about "15 Strong." The Miami Heat are NBA champions right now because Alonzo Mourning came up with six rebounds and five "don't come around here no more" blocked shots in Game 6. They're NBA champions right now because James Posey had it in him to hit a big 3 to put his club up six with three minutes and change to play. They're NBA champions because Posey, Wade, Gary Payton and Jason Williams chased, challenged, grabbed, bumped and generally made life miserable for Jason Terry and Dirk Nowitzki every time either guy touched the ball in the fourth quarter. And maybe most of all, they're kings of the hill right now because Udonis Haslem and his bum shoulder decided to go all carpe diem, decided to make like Horace Grant, and then some, coming up with 17 points, two steals, 10 boards (four of them offensive) and an assist. It's a cliché, and an unfair generalization, to say this series came down to heart. Both clubs played hard. Both teams wanted it. But when Payton grabbed Jason Terry's jersey coming around that last pick as the clock wound down Tuesday night, it felt a bit like a metaphor, like testimony to the whole Heat hunger. They were the team up a game. The Mavs were the ones with their backs against the wall. But there was Payton, with 16 years of almost-but-not-quite in his hip pocket, scratching and clawing. There was Wade, crazy for a taste, scrambling to contain Terry and Dirk out near the arc all night, not like a superstar but like a grunt trying to make the club. And there was Haslem, not content to be a bit player, transforming himself, on the biggest night of his basketball life, into a 62 percent shooter, gutting out an offensive rebound and putting the ball up and in with 1:21 left to extend the Heat lead to 91-88, putting his name in the record book, and doing everything he could to ensure the record read: Miami Heat, NBA champions. We wouldn't be talking about any of this had the Heat come up short, of course. Their desire would be less than a footnote. But they didn't come up short. They came up big. And more than that, they came up crazed, possessed, relentless, nasty and reckless. So we're going to talk about it. And more than that, we're going to say it was the difference that made the difference. Time for a role player call: Dirk defender Udonis Haslem astonished with 17 points. Antoine Walker wiggled to 14 points. Alonzo Mourning led the swat team, his five blocks energizing the Heat. James Posey's 3 and Payton's D. In all, Dwyane Wade and Shaq had clutch help. 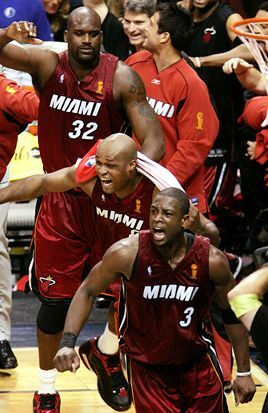 Dwyane Wade leads the Miami celebration after the Heat captured the title in Dallas. Heat guard Dwyane Wade: The NBA Finals MVP put on another amazing display (except for missing two free throws with 10 seconds left). D-Wade poured in 36 points (10-of-18, 55 percent from the field) in the clincher. And he chipped in 10 rebounds and five assists to boot. Mavs guard Jason Terry: JET couldn't locate his jumper in Game 6. He was a lousy 7-of-25 from the field, including 2-of-11 from behind the arc. Overall Dallas shot 5-of-22 on 3s, just 22.7 percent. "I mean it, I'd give up six of them for this [ring]. I would have traded them all in for this one. After 18 years ... this gives me a sense of absolute freedom from having to chase it, desperately chase it. So its very special." -- Heat coach Pat Riley, ranking his new title as his favorite. The Miami Heat were the NBA's version of the broken hearts club. Everybody had a sob story to tell. Gary Payton fell short in two Finals with Seattle and the Lakers, not to mention the year his team had the best record and lost in the first round. Jason Williams was in Sacramento when the Kings found a way to lose Game 7 of the Western Conference finals to the Lakers. Shandon Anderson missed twice with Utah, Derek Anderson came close in San Antonio and Antoine Walker had a taste of the conference finals in Boston. And of course, Pat Riley had gone nearly two decades since his last championship. But perhaps no Heat player had become more identified with postseason failure than Alonzo Mourning. He was there for all the heartbreaking losses to the Knicks in a previous Heat era, and then came back just in time to see his team blow Game 7 at home in the Detroit series a year ago. All told, Mourning had been part of four different deciding-game losses on the Heat's home court. So perhaps it was fitting that Mourning was the key role player in the Heat's championship-clinching game in Dallas on Monday night. No, he wasn't the biggest star -- that, of course, was Dwyane Wade -- but he was the difference-maker. When he checked in, the Heat already trailed by 14 points, and it seemed to nearly everyone that Miami's championship moment would have to wait for another day. But 'Zo took charge almost immediately, blocking a shot at one end and then getting a rebound and dunk at the other to cut the Dallas lead to eight. By the time he checked out early in the second quarter, Mourning helped Miami shave 11 points off the Dallas lead in a span of just 5:12. "We knew as a team that they were going to make runs," Mourning said. "We had to sustain their run with getting stops, making defensive plays. I think collectively, everybody just dug a little bit deeper." Later in the quarter Mourning rose up again, taking a sweet behind-the-back feed from Jason Williams and delivering a monstrous, I've-waited-long-enough-and-would-like-my-ring-tonight-please jam over D.J. Mbenga. That slam capped a 13-0 Heat run that gave the Heat its first lead of the game and utterly deflated the Dallas crowd. In his short burst of playing time, Mourning's defense at the back of the Miami zone was enormous. He rejected five shots all told, and even briefly guarded Dirk Nowitzki during the fourth quarter. Mourning's final line -- 3-of-4, eight points, six rebounds -- was simply awesome for only 14 minutes of action. And on a night when neither team could make a jump shot, Mourning's intimidation at the basket was crucial. The sad reality for Dirk Nowitzki is that folks probably won't remember the drive and free throw in San Antonio ... or the 50 points he hung on Phoenix ... or that early rumble down the lane Tuesday night and the lefty flush that finished it. They are mostly going to remember the finish. They will inevitably remember that 2-0 lead Nowitzki's Dallas Mavericks seized in their first NBA Finals and everything taken away from them thereafter by the new, worthy champs from Miami. "If we win that [Game 3], the series is probably pretty much over," Nowitzki said. "Maybe [we] were starting to celebrate too early, or ... I don't know what happened. "That was a tough loss that really changed the momentum of the whole series. After that, they got confidence. They played a lot better afterwards. Everybody kept making shots." • Alonzo Mourning blocked five shots in Game 6. This after neither team recorded a block in Game 5. • Dallas shot 5-of-22 from 3-point range in Game 6 (22 percent) and finished the series shooting 33-of-116 (28.4 percent). The Mavs shot 31.7 percent in the postseason after shooting 37.4 percent from downtown in the regular season. • Dwyane Wade scored a game-high 36 points. His 208 points in the series is the second most by a player in his first six Finals games (Rick Barry scored 245 in 1966). • The Heat led 49-48 at halftime and 71-68 after three quarters. This postseason, Miami has won 26 straight when leading at the half and was 14-0 when tied or leading at the start of the fourth. • Dallas was the 10th team to win the first two games of the Finals at home since the NBA changed to the 2-3-2 format in 1985. The previous nine teams won the championship. • Pat Riley went 18 years between NBA titles (1988-2006), the longest such streak in NBA history. Alex Hannum went nine years between titles (1958 Hawks, 1967 76ers).